Boxing returned to Worcester last night (Thursday) for the first time in more than five years to the delight of a capacity crowd of 2,100 passionate fans at the Palladium. 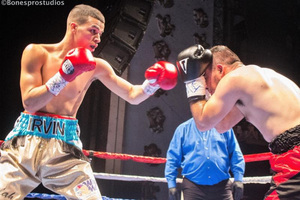 The inaugural event of the "New England’s Future" series, presented by Rivera Promotions Entertainment, featured 10 action-packed fights, highlighted by rising Worcester featherweight prospect Irvin Gonzalez (5-0, 5 KOs). "The support we received from the sold out crowd was exciting for our first show," said promoter Jose Antonio Rivera, the former 3-time, 2-division world champion. "We working on our second show in March, of course, right here in Worcester."